Ask fellow campers about "The River Forks Inn (formerly Stage Stop RV Campground)" and nearby attractions. We were looking for a "non Estes Park" spot. We had read positive "posts" prior to selecting this spot. 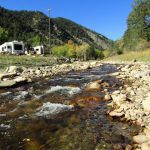 Here's what you need to think of when selecting a campsite in this area of Colorado. 1. Do you want to be away from the hustle and bustle of the city? If so, this might be your selection. It is VERY rustic. 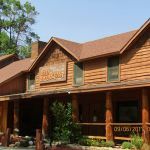 When viewing the campground's website, we were given the impression that a restaurant, beer garden, dog run and other amenities were present. That is NOT the case. The owner, while incredibly friendly, has this real estate all up for sale. Hence, the restaurant is not open...neither is the beer garden. We have 2 dogs...and were very dissatisfied with the lack of area in which to walk them. I'm not sure where a "dog run" is located...per prior reviews. Since the owner has this all up for sale, the lots were overgrown and the picnic tables were in terrible disrepair. The "live" music that is provided on Saturday night, is not worth the 45 bucks a nite...but, again...Colorado tries to make up...in the summer months...what it loses in the long winter months...with their tourism. So, one really finds themselves choosing between two "evils". Cell service was non-existent...the campground does provide DSL service, which is lethargic to say the least. Free ice was a plus...and the wonderful sounds of the river side site...were relaxing and pleasant. In the end, we were glad that we were NOT in Estes Park for our stay...but, had to "swallow" some of the missing intended perks for the 45 bucks a nite. We camped at The River Forks Inn (formerly Stage Stop RV Campground) in a Fifth Wheel. Great little CG, 10 miles from Estes and the Nat'l Park. Good utilities, nice spots on the river, though some are a little tight, super friendly/helpful manager, beautiful location, live music on Sat. nights, nice dog run area. It's a beautiful drive on the canyon road going into Estes or Longmont. We had limited cell service using our cell signal booster (Wilson Electronics), but it was good enough. There's no TV and satellite is somewhat limited. Being on the river is really nice. We camped at The River Forks Inn (formerly Stage Stop RV Campground) in a Motorhome. Rustic Park. We enjoyed our premium site that was parallel to the river. The back in sites looked a bit tight but they did back to the river. We enjoyed evening fires with the camp host who is friendly and helpful. Wi-Fi was the fasted I have ever seen at any park. Our cell booster got us a weak signal with Verizon otherwise there is no cell service. The camp host has a phone for emergencies. The mountain water tasted GREAT!! Lots of wildlife (deer, mountain sheep & bear) to view and they stay on the other side of the river. Small park and there are some year round residents. We looked at other parks in Estes but in our opinion they were no better. So we stayed here an extra week. We camped at The River Forks Inn (formerly Stage Stop RV Campground) in a Motorhome. This is a great alternative to Estes Park. Much quieter and peaceful, nice shade in every spot next to the river, and centrally located to Estes Park, Loveland, and Fort Collins. The Park Manager does a great job getting to know everyone and is on top of everything. The rate of $36 per night was based on a weekly stay of $250 (7 nights). Normally the nightly rate is $45, the monthly rate is $800. There is no cell phone coverage between Estes Park and Loveland, but a phone is available in the office. Free internet Wi-Fi is very good. Satellite TV is available if you have your box, but there are better things to do in the Rockies than watch TV. I hope to stay here for a longer period again someday. Keep up the great job! We camped at The River Forks Inn (formerly Stage Stop RV Campground) in a Travel Trailer. We went here because of the last review and he's right, it is a beautiful RV park. Every single site is on the river and they all have shade, but plenty of easy room to get in and out of all the spots and we drive a 45 foot motorhome. The website is way out of date. There is no restaurant, there is no store. The park manager is truly awesome. He makes this place. Super nice guy, on top of everything and has made big improvements. Grass everywhere on the sites, each site has a picnic table, electric, water (with great pressure), and sewer. (The website says W/E only, but they all have sewer now.) Some sites are set for motorhomes to be head in (so your door is near the river), and some are set for trailers or to be backed in. (But there tend to be sewer hookups on both sides, so you can do it any way you want.) Live music on Saturday nights (who weren't bad). The bathroom and shower is lock controlled and was very clean. No tents, RV's only. The only minus is that some of the spots are very close to your neighbor. The park manager works hard to put small rigs next to bigger rigs so it feels bigger, but some spots are just close even though there are little fence's dividing you from your neighbor. But you tend to congregate at the river end of your site, not at the side of your rig like most campgrounds. There are two 50 amp spots and the rest are 30 amp. The park has free Wi-Fi, each site has a satellite TV with hookup and you can rent a decoder if you need one and cell phones don't work anywhere in the canyon between Loveland and Estes Park, but there is a pay phone on site. Very pet friendly campground and there is a nice off leash dog run on the other side of the river (across a foot bridge) and you can hike up the side of the mountain if you want. The dog run even has a trash bin with waste snoopers already there. That's the level of detail here. Not a lot for kids to do except play/fish the river, hiking and a large flat grassy area to play in. Estes Park is about 15 minutes away and Loveland is about 20 minutes. The town post office is on the property. About 1/2 the spots are big rig capable. We would camp here again. We camped at The River Forks Inn (formerly Stage Stop RV Campground) in a Motorhome. We have been to the Stage Stop R.V. Park for several years, (more for the price and river) than anything else. This year it was completely different! They have a new camp manager that is reworking the whole park. He's friendly, helpful and makes you feel like a special guest. When you pull in he will furnish you with whatever you need and wants to make sure you're satisfied with your stay. In the past the areas to park were rough and unkept with no sewer hook-ups. Now they are mowed, divided with fences and have sewers. They have also added Satellite TV service,a Saturday "Meet and Greet"(with live music and food) and morning coffee with cinnamon rolls. We stayed there 6 weeks this summer and hope to go back soon. We camped at The River Forks Inn (formerly Stage Stop RV Campground) in a Motorhome. Review removed by admin. We camped at The River Forks Inn (formerly Stage Stop RV Campground) in a Motorhome. This location has a great deal of potential, but the owners act like they've just given up. 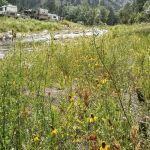 The weeds near the stream and between sites is overgrown and the grass is spotty. If you can even get someone to come to the door of the office (ring bell and WAIT only to find out it doesn't work! ), then they are very friendly and accommodating. You are given few instructions. (Where's the dump station, trash bin, etc.?) And there is nothing printed except your receipt. It would have been nice to be given some sort of instructions as to where to stroll, be careful of the stream, etc. The weeds in the front of the office would make one think that they've gone out of business. The sites themselves are okay (good water pressure, reliable power), but they need some serious TLC. (Table was filthy and overgrown with mold or lichen or something.) Long-term residents evidently aren't given instructions as to how to keep up their place: looks like a trailer park. Sad to see a place with so many possibilities just allowed to "junk up." We camped at The River Forks Inn (formerly Stage Stop RV Campground) in a Motorhome. Are you affiliated with The River Forks Inn (formerly Stage Stop RV Campground) ?